Bryan Reynolds | The Lima News Cody Birt, 11, of St. Marys cheers as he reaches the end of the slide, splashing into the water at the new swimming pool at Grand Lake St. Marys State Park Campground Friday. ST MARYS — A pool full of children splashed a wall of water into the air as Jim Zehringer, Ohio Department of Natural Resources director, State Rep. Keith Faber (R-Celina) and many other people cut the dedication ribbon for the new swimming pool at the Grand Lake St. Mary’s State Park Campground, Friday. 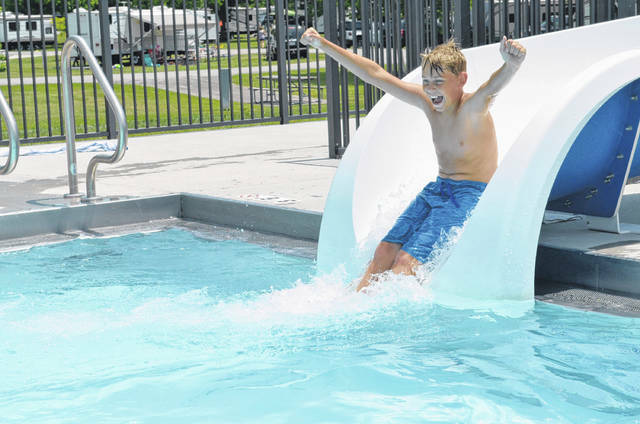 The $1.7 million pool was created as a compliment to the splash pad and also an attraction was needed to keep campers coming to the campground, Faber said. John Bergman, Auglaize County Commissioner, said he was pleasantly surprised at how great the pool looked when he arrived for the dedication. The funding for the swimming pool came from $500 million of capital infrastructure funding set aside by Ohio as a push to improve Ohio State Parks. The goal of this investment is two-fold, Faber said: to improve amenities Ohio State Parks offers visitors and to improve natural resources like water quality. ODNR also dedicated a brand new $5.8 million spillway at Lake Loramie State Park to replace the old spillway which had been literally falling apart, Zehringer said. This new spillway is a labyrinth design. It’s half the size of the old spillway but it’s just as effective as the old spillway, he said. The new pool at the Grand Lake campground is just one of many improvements made at Grand Lake St. Marys to attract visitors. Zehringer said ODNR posted a survey on their website asking individuals who camp at Ohio State Parks the kinds of improvements they would like to see installed. Around 9,000 people responded and three improvement suggestions were made and implemented by ODNR: more restrooms/shower houses, more shelter houses and full service hook-ups at camping locations, said Faber. David Faler, park manager at Grand Lake St. Mary’s State Park, said the campground has seen a steady incline in visitors as new restrooms and a new shelter house were built. The campground has also installed full service hook-ups. On Memorial Day weekend Faler said the Grand Lake campground was filled to 104 percent capacity and they had to use the eight primitive campsites the campground sets aside to handle overflow. https://www.limaohio.com/wp-content/uploads/sites/54/2018/06/web1_pool.jpgBryan Reynolds | The Lima News Cody Birt, 11, of St. Marys cheers as he reaches the end of the slide, splashing into the water at the new swimming pool at Grand Lake St. Marys State Park Campground Friday.